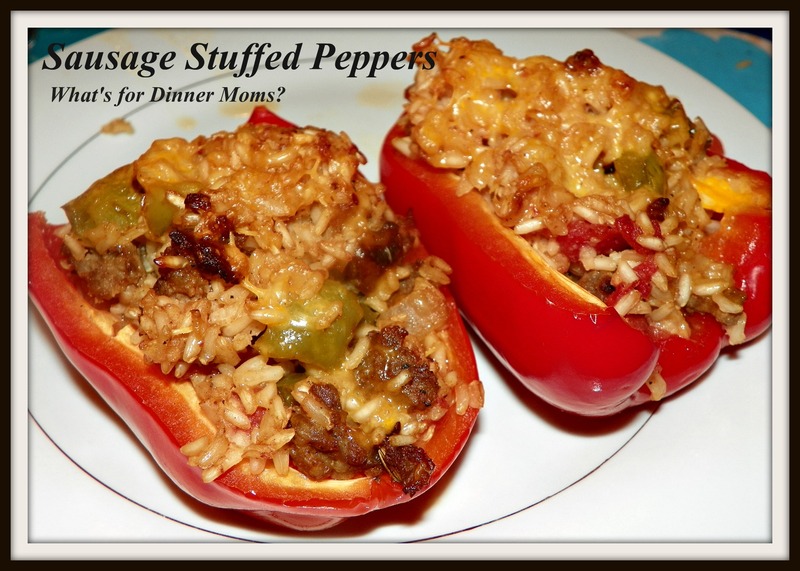 Italian Sausage Stuffed Peppers – What's for Dinner Moms? When you need dinner on the table quickly having frozen dinners in your freezer can really help make the dinner process go much smoother. Casseroles, stuffed peppers, soups and lasagnas freeze very well. Make a double batch of dinners either on a weekend or when you have extra time to make dinner one evening and you will have a dinner in your freezer for those nights that you have to be three places at once. Remember to take the dish out of the freezer and thaw in the refrigerator the evening before or the morning that you want to cook the item. Sausage stuffed peppers freeze well. I have made 10-20 at a time and frozen them for friends and family to have on hand during crisis times. They reheat well and still taste delicious. This was a bit of a mixed verdict from my family. They all liked the taste but my daughter hates brown rice. Actually, make that rice of any kind unless it is with Chinese food and even then she prefers noodles. So she picked all the stuff out of the rice and then ate the peppers. All, the peppers. If someone didn’t finish their pepper she scraped out the rice and ate the pepper. My mostly gluten-free son loved these. I think because they were flavorful and I didn’t have to make any substitutions for his meal. He loves getting to eat exactly what we are eating. Rather than stuff the rice inside a whole pepper I cut them in half lengthwise so that I could heap the rice filling into the shells. This lowered the rice to pepper ratio which in my mind made them much better. I served this with a green side salad and green beans. Preheat oven to 350 degrees. Prepare peppers and lie them cut side up in 2 13 x 9 pans. Begin cooking rice according to package directions substituting chicken stock for water. If you don’t have chicken stock just use water but this adds more flavor to the rice and the dish. In a skillet over medium heat begin cooking the Italian sausage. Break it up into small pieces as it is cooking with the side of your spoon. Once sausage is fully cooked remove it from the skillet to clean paper towels using a slotted spoon leaving the grease in the pan. Add onions, peppers, garlic and celery to the pan and cook until onions begin to turn translucent 5-7 minutes. Stir well scrapping up the brown stuff on the bottom of the pan. Once rice is cooked stir the sausage, onion and pepper mixture, can on tomatoes, salt and pepper into the rice. Stir until all is well incorporated. Taste and adjust seasonings as needed. Stuff peppers with heaping amounts of rice. Pat it down to spread it out to fill the cups of the pepper. Once all peppers are stuffed sprinkle with cheddar cheese. Place about 1/8″ of chicken stock (or water) in the bottom of each pan before placing them in the oven. Bake for 20-30 minutes until pepper shell has softened and rice is warmed through. Next Post Meet and Greet Weekend! Wait – these look amaaaazing! And all ingredients we randomly still have in our kitchen after just returning from our Peruvian getaway. Now I can’t wait for dinner tonight. Yum! Yeah! Those first meals home are always tough because you don’t want to go shopping! Stuffed peppers are awesome, these look great! Thank you so very much! They are so simple!